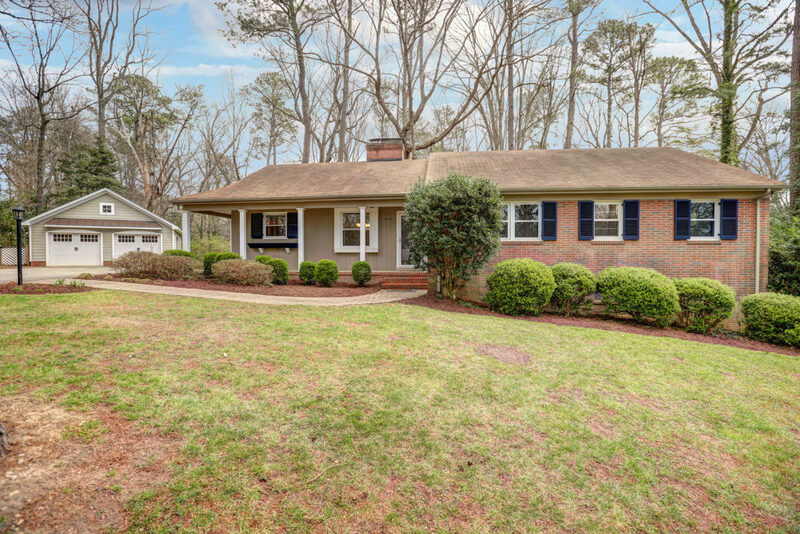 Enjoy the timeless character of this Mid-Century all brick Ranch home on a 0.75 acre lot, with a surprisingly spacious interior on two levels, offering 4 bedrooms, 3 full baths, 2 fire places, extensive renovations, and additional, partially finished areas in the lower level that are not included in the finished square foot calculations. A charming covered porch wraps the front corner, and provides convenient daily, at grade, direct access to side and front doors. The home has fresh, modern paint, and a fabulous plan, including a center foyer leading to an extra wide bedroom hallway. There is a dramatic living room with fireplace, a built-in display area, with a picture window overlooking the rear yard. There is direct access into the dining room and cheerful Eat-in Kitchen. Three of 4 bedrooms are on the first level, including the Master with a private bath. The lower level walks out to a stoned-paved patio, includes a generous recreation room, a 4th bedroom or office, and a 3rd full bath – you also have the option for a Family or Guest Suite. More details include gleaming hardwood floors, replacement windows, new heat pump HVAC in 2013,and an abundance of storage in both the walk-up attic and partially finished areas of the basement. The over-sized 4 car detached Garage with Craftsman detailing is icing on the cake. This is it, turn-key, just waiting for your arrival! Please schedule your visit soon! and partially finished basement area (618 sq. ft.) not included in the finished square foot calculations.